1. The Constitution of the Federal Republic of Nigeria Cap. C23, Laws of the Federation of Nigeria. 2004 (in this Act referred to as “the Principal Act”) is altered as set out under this Act. 3. Section 84(4) of the Principal Act is altered by inserting immediately after the words “Judge of the Federal High Court” in line 4, the words “President of the National Industrial Court, Judge of the National Industrial Court”. 4. Section 240 of the Principal Act is altered by inserting immediately after the words “Federal High Court” in line 3. the words “the National Industrial Court”. “(2) An appeal shall lie from the decision of the National Industrial Court as of right to the Court of Appeal on questions of fundamental rights as contained in Chapter IV of this Constitution as it relates to matters upon which the National Industrial Court has jurisdiction. Industrial Court to the Court of Appeal as may be prescribed by an Act of the National Assembly: Provided that where an Act or Law prescribes that an appeal shall lie from the decisions of the National Industrial Court to the Court of Appeal, such appeal shall be with the leave of the Court of Appeal. 254 B (1) The appointment of a person to the office of President of the National Industrial Court shall be made by the President on the recommendation of the National Judicial Council subject to confirmation of such appointment by the Senate. (3) A person shall not be eligible to hold the office of a President of the National Industrial Court unless the person is qualified to practice as a legal practitioner in Nigeria and has been so qualified for a period of not less than ten years and has considerable knowledge and experience in the law and practice of industrial relations and employment conditions in Nigeria. (6) Except on the recommendation of the National Judicial Council, an appointment pursuant to the provisions of subsection (5) of this section shall cease to have effect after the expiration of three months from the date of such appointment and the President shall not reappoint a person whose appointment has lapsed. National Industrial Court shall have the jurisdiction and power to deal with any matter connected with or pertaining 10 the application of any international convention, treaty or protocol of which Nigeria has ratified relating to labour, employment, workplace, industrial relations or matters connected therewith. (5) The National Industrial Court shall have and exercise jurisdiction and powers in criminal causes and matters arising from any cause or matter of which jurisdiction is conferred on the National Industrial Court by this section or any other Act of the National Assembly or by any other law. 254D (1) For the purpose of exercising any jurisdiction conferred upon it by this Constitution or as may be conferred by an Act of the National Assembly, the National Industrial Court shall have all the powers of a High Court. 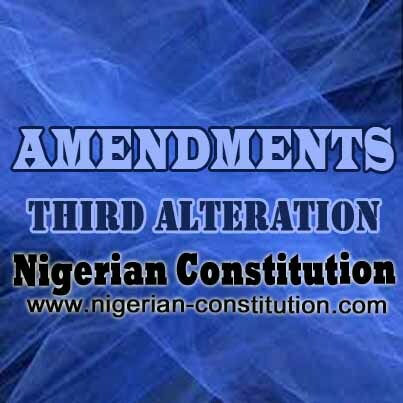 (2) Notwithstanding subsection (I) of this section, the National Assembly may by law, make provisions conferring upon the National Industrial Court powers additional to those conferred by this section as may appear necessary or desirable for enabling the Court to be more effective in exercising its jurisdiction. 254 E (1) For the purpose or exercising any jurisdiction conferred upon it by this Constitution or any other law, the National Industrial Court shall be duly constituted if it consists of a single Judge or not more than three Judges as the President of the National Industrial Court may direct. (2) For the purpose of exercising its criminal jurisdiction, the President of the Court may hear and determine or assign a single Judge of the Court to hear and determine such matter. (3) For the purpose of exercising any jurisdiction conferred upon it by the Constitution or any other law, the Court may. if it thinks it expedient to do so or in a manner prescribed under any enactment, law or rules of court, call in the aid of one or more assessors specially qualified to try and hear the cause or matter wholly or partly with the assistance of such assessors. (4) For the purpose of subsection(3) of this section, an assessor shall be a person who is qualified and experienced in his field of specialization and who has been so qualified for a period of not less than ten years. 254F (1) Subject to the provisions of any Act of the National Assembly, the President of the National Industrial Court may make rules for regulating the practice and procedure of the National Industrial Court. (2) For the purpose of exercising its criminal jurisdiction, the provisions of the Criminal Code, Penal Code, Criminal Procedure Act, Criminal Procedure Code or Evidence Act shall apply”. 7. Section 287(3) of the Principal Act is altered by inserting “the National industrial Court” immediately after, “the Federal High Court”, in lines 1 and 4 respectively. 8. Section 289 of the Principal Act is altered by inserting immediately after the words “a Judge of the Federal High Court or” in line 2, the words “Judge of the National Industrial Court”. 9. Section 292 of the Principal Act is altered in subsection (1)(a)(i), line 2, by inserting immediately after the words “Federal High Court” the words, “President of the National Industrial Court”. 10. Section 294(4) of the Principal Act is altered by inserting immediately after the word “Appeal” in line 2, the words “or the National Industrial Court”. (e) in paragraph 21(a)(i), by inserting immediately after the words “Federal High Court” in line 4, the words “the President and Judges of the National Industrial Court”. The Seventh Schedule to the Principal Act is altered by inserting immediately after the words “Federal High Court” in line 4 under “Judicial Oath”, the words “President/Judge of the National Industrial Court”. Speech By The Senate President Dr. Abubakar Bukola Saraki, At The Senate Ad-HOC Committee On Constitution Review - 17th June, 2016.